The Poti Marara was born in the 60s. It is a Polynesian fisherman, Leonard Deane, who designed this boat. Originally intended for net-fishing Marara (flying fish) within the lagoons, it then evolved to Mahi-Mahi fishing outside, out in the ocean. Decked out with a flat hull at the start, the Poti Marara inherited a V-shaped hull that is better able to tackle ocean and rough seas. The main feature of this boat is its cockpit. Located at the front, the bar is a "broomstick" that allows you to maneuver the boat with one hand very easily while fishing on the other. The sizes have also evolved. From 12/13 feet initially for lagoon fishing, there are now units of more than 30 feet. Rangiroa, paradise island rich of marine fauna and flora, a multitude of species of fish and mammals, that's where I landed. 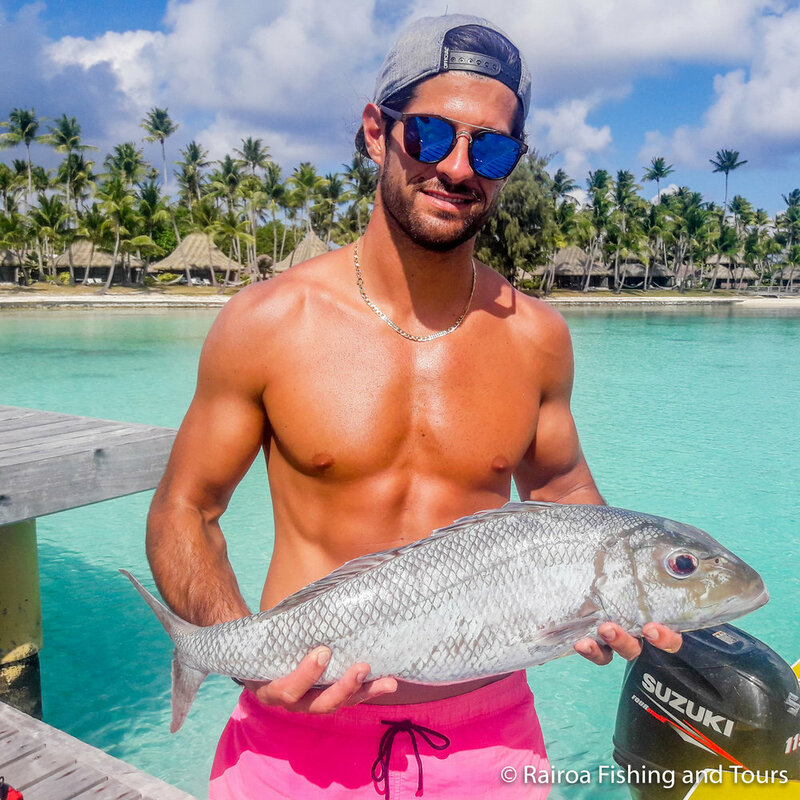 I am Emmanuel, originally coming from Raivavae in the Australs islands, I was attracted by Rangiroa lagoon, filled with shades of blue colors. I created Rairoa Fishing and Tours to make you discover wild and paradisiac places. Our philosophy is to make your vacation unforgettable, focusing on your specific demand, in a dream setting. We welcome you all year long. My boat is named Tuturivahine, it is built in 2009 by Coco Dean. It is a 20 feet Poti Marara, powered by a 115 HP Suzuki, 4 stroke outboard. Homologated for tourists transportations, for 6 people. White and pink sand , Turquoise blue and always warm water will really make you feel in paradise. The day starts around 8.30 with a free pick up at your accommodation. The car will bring you at Ohotu pier, where you will be welcomed on the boat. The boat ride will last about an hour. Arrived at the Blue Lagoon you can refresh yourself with a drink and then start exploring the site. A little guided walk will take you through the "Birds Island" an island still virgin where live many endemic species of birds, such as Vini, Kotchotcho, Chevalier, just to cite a few. The next destination is the pink sands where you will also enjoy the first snorkeling opportunity of the day in the "coral garden". After a little walking and snorkeling it is time for eating. 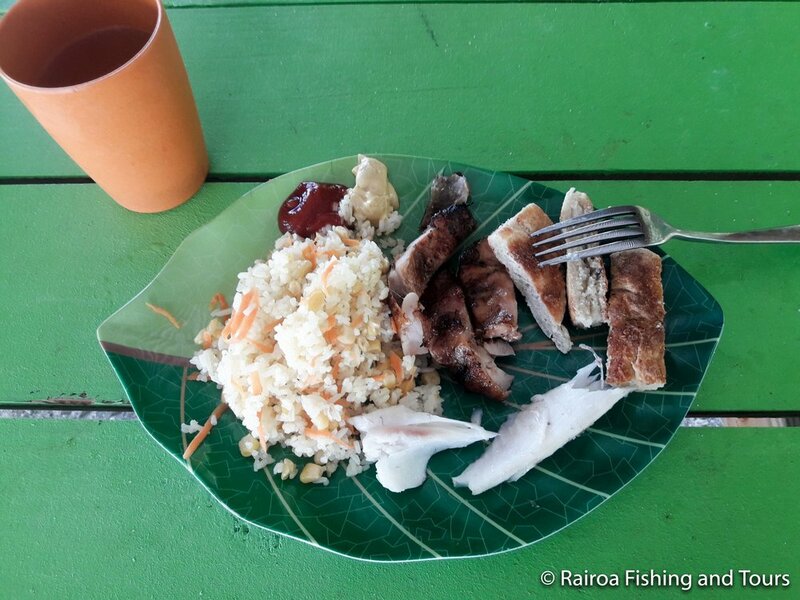 An example of lunch is Barbecue chicken, freshly caught grilled fish, rice salad and the popular cooked in leaves coconut bread. After lunch you will have some time for relaxing or doing some more snorkeling in the blue lagoon. Last stop before ending the day is a snorkeling session at the "Aquarium" a protected area with an incredible amount and variety of tropical fishes. The best way to end up a great day! 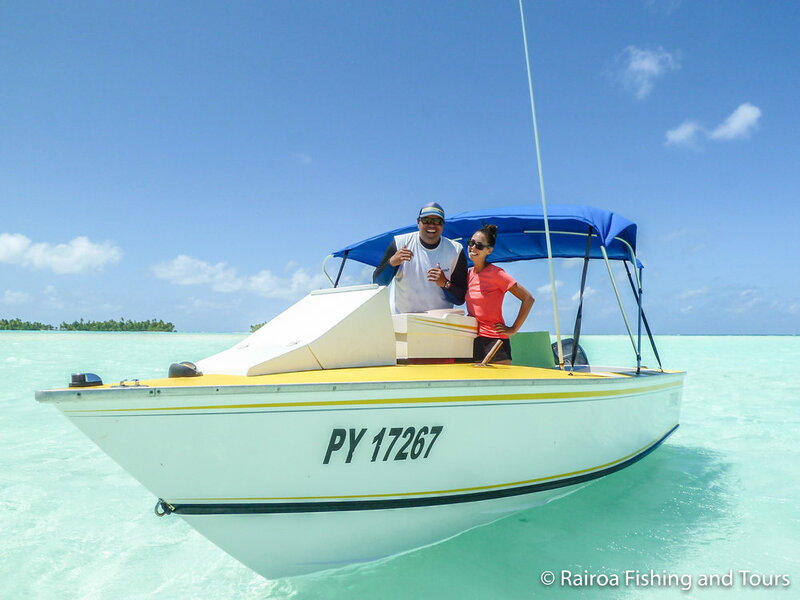 Discover the different possibilities of fishing with Rairoa Fishing and Tours. The guide will take you to his best secret fishing spots on the island. The spearfishing is a sport that requires a minimum of physicals condition. It's practiced in apnea with depths ranging from two meters to ten meters. Security is enforced. Spearguns and a diving equipments will be provided. 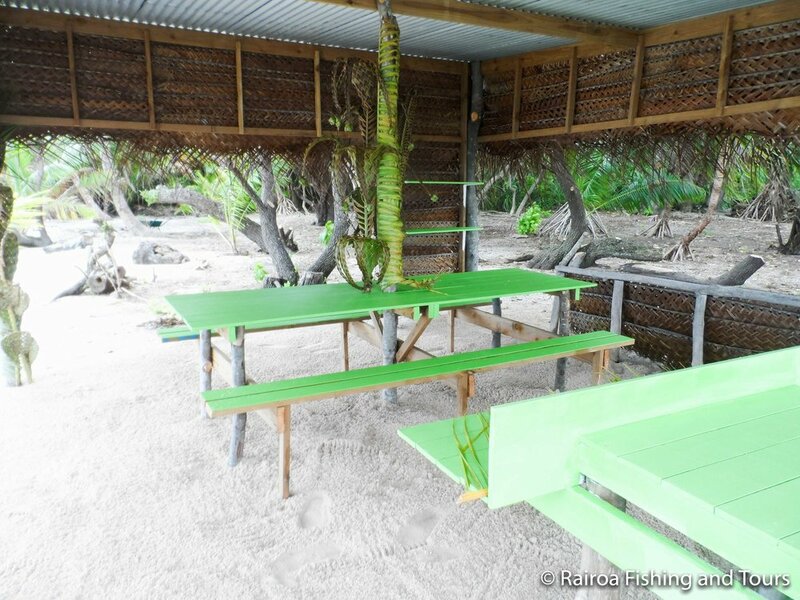 Rangiroa offers incredible spots for fly-fishing. Bonesfish and jacks are main targets. The guide will advise you on the choice of the flies. Bring your own gear. In option, we can prepare a special lunch with some drinks. To avoid disappointment we suggest to book in advance and plan your adventure for the firsts days of your stay in Rangiroa. Will you come pick me up at my hotel? Yes, the pick up is included. Just write the name of your hotel in the booking form. Can I do the excursion before catching my flight? The excursion to the blue lagoon is a "whole day excursion" that means that we leave around 8.30am and come back around 4.30pm. If you are boarding the 6.30pm flight then yes, it is possible. In other cases it is only possible if you do a private excursion, that way we can adapt the program to your need. I booked an excursion to blue lagoon, is it automatically confirmed? Unfortunately we cannot confirm the excursion to the blue lagoon unless we have reached the minimum amount of passenger. If you want to be sure to go to the Blue Lagoon I suggest you to book the "Blue Lagoon Guaranteed Excursion" in that case it is confirmed even if not reached the minimum amount of passenger. You should bring your sunscreen, reef shoes and if you want a towel. We provide food and drinks and a mask/snorkel although, for best fitting, I suggest you to bring your own. We always try to upgrade our service, please do tell us any suggestion or idea you may have.